Comment: This item shows wear including a gift inscription or name, a small tear in the cover, and moderate wear to edges and cover. When I was a kid, two of my favorite books were by an amazing man named Remy Charlip. Fortunately and Thirteen fascinated me in part because, in both books, the very act of turning the pages plays a pivotal role in telling the story. Each turn reveals something new in a way that builds on the image on the previous page. Now that I’m an illustrator myself, I’ve often thought about this dramatic storytelling device and all of its creative possibilities. My new book, The Invention of Hugo Cabret, is a 550 page novel in words and pictures. But unlike most novels, the images in my new book don't just illustrate the story; they help tell it. I've used the lessons I learned from Remy Charlip and other masters of the picture book to create something that is not a exactly a novel, not quite a picture book, not really a graphic novel, or a flip book or a movie, but a combination of all these things. I began thinking about this book ten years ago after seeing some of the magical films of Georges Méliès, the father of science-fiction movies. But it wasn’t until I read a book called Edison's Eve: The Quest for Mechanical Life by Gaby Woods that my story began to come into focus. I discovered that Méliès had a collection of mechanical, wind-up figures (called automata) that were donated to a museum, but which were later destroyed and thrown away. Instantly, I imagined a boy discovering these broken, rusty machines in the garbage, stealing one and attempting to fix it. At that moment, Hugo Cabret was born. A few years ago, I had the honor of meeting Remy Charlip, and I'm proud to say that we've become friends. Last December he was asking me what I was working on, and as I was describing this book to him, I realized that Remy looks exactly like Georges Méliès. I excitedly asked him to pose as the character in my book, and fortunately, he said yes. So every time you see Méliès in The Invention of Hugo Cabret, the person you are really looking at is my dear friend Remy Charlip, who continues to inspire everyone who has the great pleasure of knowing him or seeing his work. Paris in the 1930's, a thief, a broken machine, a strange girl, a mean old man, and the secrets that tie them all together... 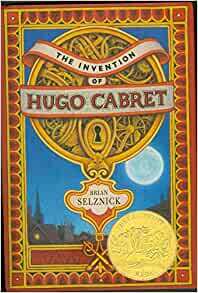 Welcome to The Invention of Hugo Cabret. This is a finished drawing that I had to cut from The Invention of Hugo Cabret. I was still rewriting the book when I had to begin the final art. 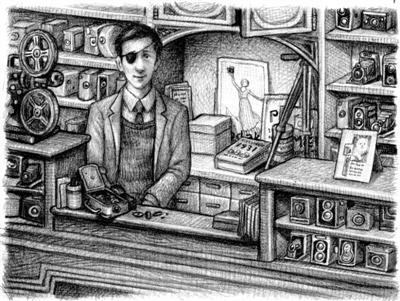 There was originally a scene in the story where this character, Etienne, is working in a camera shop. On one of my research trips to Paris I spent an entire day visiting old camera shops and photographing cameras from the 1930's and earlier, as well as the facades of the shops themselves. I researched original French camera posters and made sure that the counter and the shelves were accurate to the time period. I did all the drawings in the book at 1/4 scale, so they were very small and I often had to use a magnifying glass to help me see what I was drawing. After I finished this drawing I continued to rewrite, and for various reasons I realized that I needed to move this scene from the camera shop to the French Film Academy, which meant that I had to cut this picture. I tried really hard to find ANOTHER moment when I could have Etienne in a camera shop, but, as painful as it was, I knew the picture had to go. 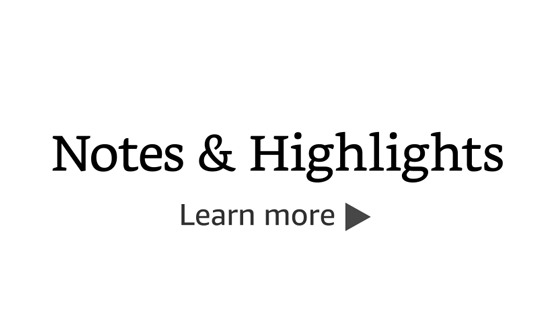 I'm glad to see it up on the Amazon website because otherwise no one would have ever seen all those tiny cameras I researched and drew so carefully! 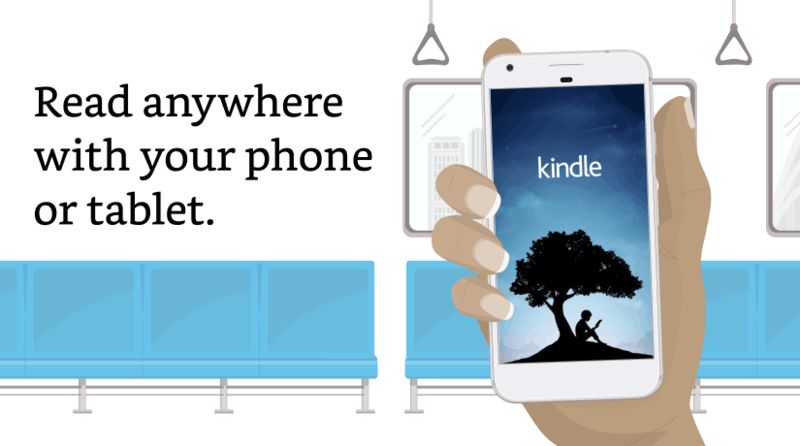 Start reading The Invention of Hugo Cabret on your Kindle in under a minute. The Invention of Hugo Cabret is the basis for the Martin Scorsese film "Hugo." I saw the movie first and then read this book. The book is simply amazing and is mostly pictures with a few pages of text interspersed. 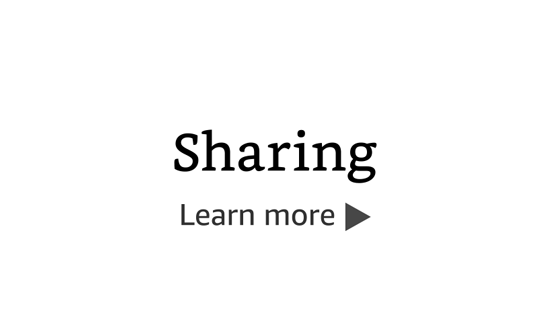 One might even call it experimental fiction. Whatever you call it, this book is awesome and was incredibly well-researched and is a Caldecott award winner. I was able to read this in less than an hour and a half, even though it has well over 500 pages, so don't be discouraged by the size of it. There are some small differences between "Hugo" the movie, and the book, but they are relatively trivial (although I like the ending in the movie better than the book's ending). Quite simply a very well thought out and written children's story that is fit for readers of all ages. 5.0 out of 5 starsReview from a 6 year old. I finished reading this book tonight all by myself. Really great book. Everyone should read it. Really cool story. So many pages!!! Great ending. 5.0 out of 5 starsUnlike any book I've ever seen before; the detailed illustrations are AMAZING! This book is a keeper!! Will delight all ages! This book is AMAZING if only for the illustrations alone. But when coupled with a wonderful story as well, you have a winner that will delight all ages. I just love looking at the detailed illustrations! 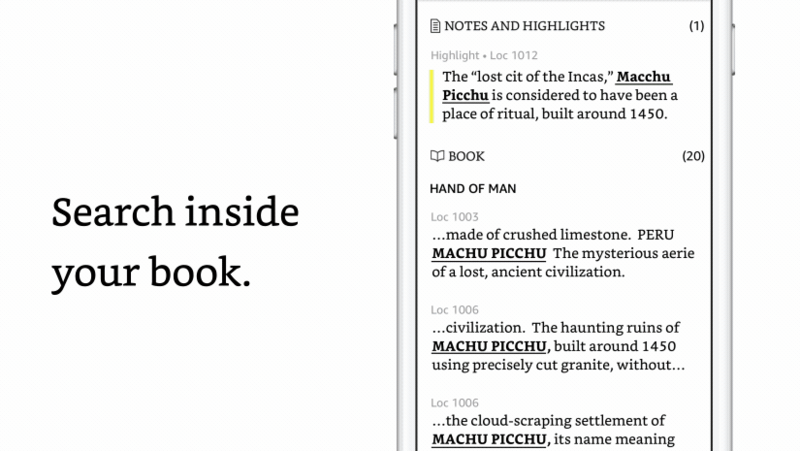 It's unlike any book I've ever seen before. I'm so very glad I bought this! I've already ordered two more of Brian Selznick's books. These books are keepers! Please let me know if you found this review helpful to you. 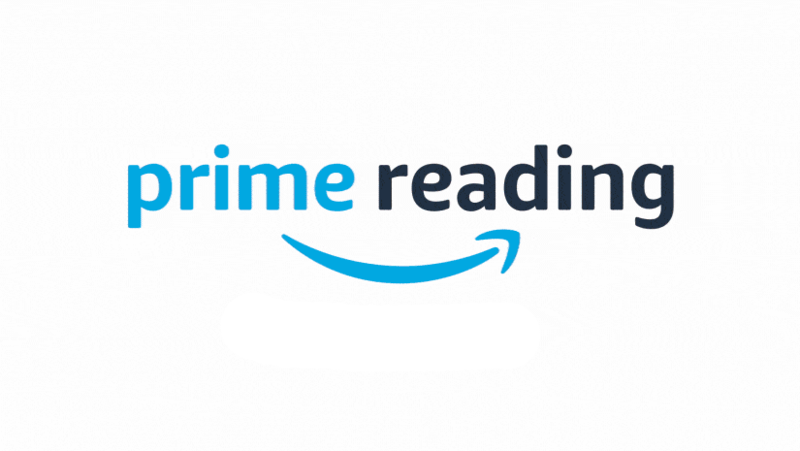 Like you, I rely on reviews when I buy online, and I'd like to know if mine are helpful. Thanks! The artwork in this volume was magnificent. I had seen the movie several years ago, but this is a rare situation where the book was full of even more visual splendor than a movie. 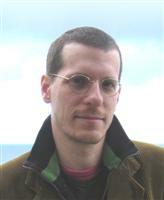 Brian Selznick is both a great storyteller and a brilliant artist. Beautifully crafted story both in words and illustrations. It reads like an old black and white movie. The illustrations are breath taking- every time I look I see a new detail. Love that they are rendered solely with graphite and charcoal. It gives the book a historical feel like you are in a time before color which just enhances the story so much. I had such a sense of wonder when I finished that I will be reading his entire line. I simply have never had this experience before. No book I've read has ever combined graphics as part of the actual movement of the story - not as supportive to the dialog, not to clarify the words, but as vehicles themselves to carry the story forward. They are pencil drawings, beautifully shaded. It is a more like the merging of a book and a silent black and white movie. Good stories are layered. The tale hangs mainly on our protagonist, the orphan Hugo, living within the walls and spaces of a Parisian train station. He has taken on the function of time keeper/clock winder that his now missing uncle once performed. A mysterious mechanical man in disrepair, left to Hugo by his beloved father, becomes the vehicle to join the child to another station character - the crotchety toy merchant who maintains a small shop in the main concourse. Hugo uses pieces from the mechanical toys - which he has stolen from the merchant - to tinker with the mechanical man. Once he is caught, we have the opportunity to learn more about the old man through Hugo's interaction with him and his young niece, Hugo's new friend. The pivotal character of the station's toy merchant pulls us further into this world when Hugo discovers his past as a magician and as a pioneer with film. 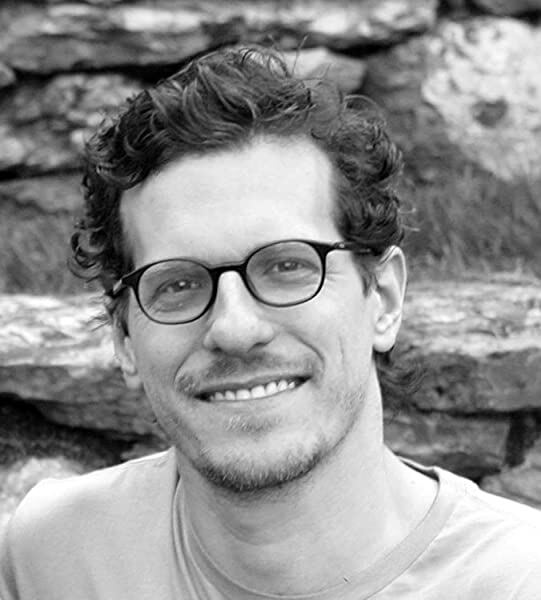 By placing the story within a train station, Brian Selznick can tip his hat to some of the groundbreaking first attempts at film which used the same type of venue, as well as the genius of imagination that was set free with this new medium. The great clocks of the station's tower help us remember Harold Loyd, and the trains were the subjects of some of the first films. It is at this point that the use of the black and white illustrations takes on another function, speaking to us about the dramatic way images, without sound and color, can still speak to us so eloquently. This is one of those special books that has a compelling story that can be read by a young reader, and at the same time can be a bridge to historical events when read by an adult. 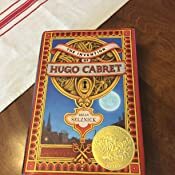 I chose to explore Hugo Cabret after seeing a trailer for the movie "Hugo." 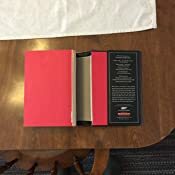 My intention was to pre-screen the book to see if it was appropriate for a great niece's Christmas present. To my surprise, as an adult I was enthralled. And as so often happens, the book's story became a doorway - it led me to trace more information about the earliest experiments with film. The relationship between early film and magicians was a surprise to me. And perhaps as a person living approximately a century after film began, let alone having no memory of a life without it, it is understandable that I had no perspective about the effects of the first films on their viewers - a world of imagination, nightmares and dreams. How strange, magical and wonderful it all must have seemed. Knowing Scorsese's love of film history, I am now anxious to see how he has brought this book to film to tell both a child's story and to help all of us appreciate the evolution of what we are watching. This was such a very good book. I loved how the author took us into the world of the book through words and pictures. 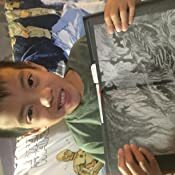 I bought the book because my 5th grade grandson raved about it. I knew that I needed to read it also. Thanks for the good read. Just as all of the other viewers have stated...this book is enchanting! My son (11) fell in love with this book and even dressed as the boy for Halloween. The illustrations are beautiful. I would consider this to be historical fiction as it is based on the true life story of Hugo Cabret. And if you didn't see the movie...you must! This book is heartwarming and illustrates the what true friendship is. Even now, 4 yrs after purchase, I still pick it up and re-read. Highly recommended!